I've written 21 computer books in the past decade, documenting thousands of subjects in tree-killing detail. One of my pet peeves as a technical writer is covering something that readers are unlikely to need and should never, ever use, like the discussion board component in FrontPage 2000. I devoted an entire chapter to it in Sams Teach Yourself Microsoft FrontPage 2000 in 24 Hours, a mistake I rectified in subsequent editions. FrontPage 2000 supported discussion boards with FrontPage Server Extensions and a bland web site template that used frames, as you can see on this Pot Bellied Pigs forum. I can't find a single publisher running a discussion board successfully with this software. I was reminded of this when I wrote the draft RSS specification and had to cover the textInput element. 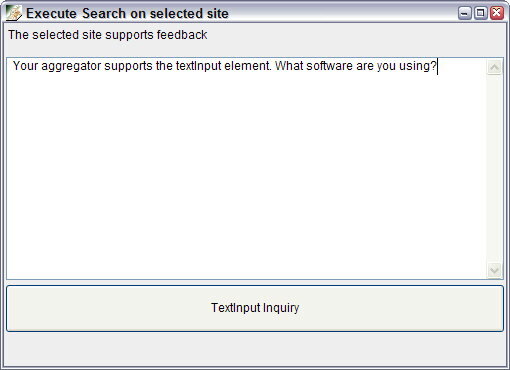 Nobody uses textInput, even though it has been a part of RSS since the first version was published by Dan Libby in 1999. Aggregators don't support it and RSS publishers don't include one in their feeds. Because I had to document it anyway, I decided that at least one person should support it. I included textInput in all of my RSS feeds for the past two months, using the element to ask the question, "Your aggregator supports the textInput element. What software are you using?" I also wrote a PHP script to collect input from anyone who answered this question. I had to take textInput out of my feeds because its title was being interpreted as the feed's title, causing My Yahoo and other RSS software to change the name of my weblog from Workbench to TextInput Inquiry. Before I removed it, two RSS aggregators were found that take textInput: James Robertson's BottomFeeder and the Liferea aggregator for Linux. In BottomFeeder, any feed that has a textInput element includes a right-click menu command: Feedback, Send Comment on Feed. Choosing the command opens a dialog box that demonstrates Robertson is either extremely detail-oriented or couldn't resist implementing the most useless feature in RSS. Pretty piss poor XML parsing to mistake the title element within the wrong parent element, IMHO. What was the inspiration for textInput to begin with? I used to run a [moderately] trafficked site using FrontPage message board. It locked up and became unusable after it accumulated 100 messages. Total piece of crap. Fortunately I know what I'm doing now (so to speak), and message boards have come a long way. I'd suggest that it's only the most useless feature because no-one supports it. Being able to pass info back from an agg is potentially *extremely* useful. Imagine HTML browsers if HTML didn't support form elements. Even if textInput was widely supported, it only offers a one-field input form with one label. How much use could anyone get out of that? Heh. Back when I started doing BottomFeeder, it looked like a potentially useful feature, so I supported it. If I recall correctly, a few feeds used to offer search results via TextInput. But that was a long time ago now. Some of the feeds that Slashdot supports through its "slashboxes" feature include textinput. IIRC, Google and Freshmeat are two that do. In fact, textinput is the earliest memory I have of implementing RSS from years back. I'd like to use textInput for search but have no idea if it should return HTML or RSS code. Right now I just have it doing a HTML search.